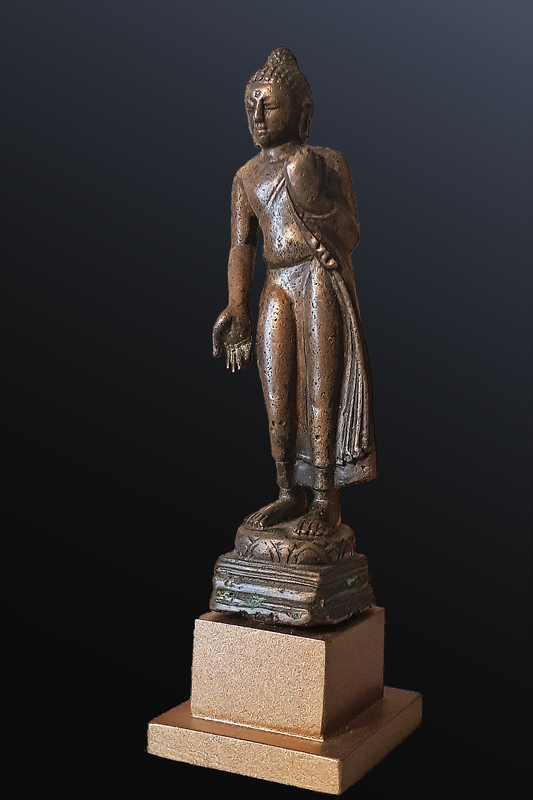 Rare Buddha standing on a lotiform pedestal in a graceful contrapuntal pose. With his right arm he sketches the giving gesture, while with his left hand he delicately holds the hem of his garment. 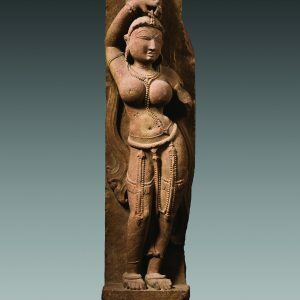 This classic iconography is here rendered with the particular elegance of post-Gupta art. 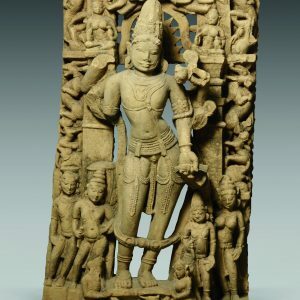 It is indeed in a second period, after the political apogee of the great Indian dynasty, that the silhouettes become so refined. The style is very fluid, characterized by beautiful finesse and sensitivity. 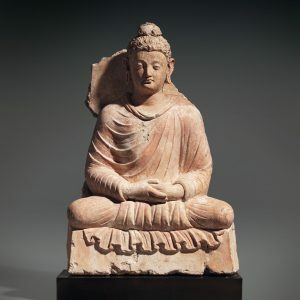 The face, first: Idealized, with fine and youthful features, Buddha is almost smiling. His half-closed eyelids impart the meditative and peaceful expression to the Blessed One. 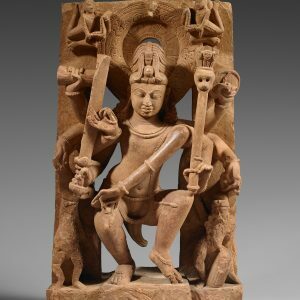 The well-defined curls of hair, the ūrṇā, the eyebrows in slight relief and the mouth, small and finely drawn, are all details highlighting the care given to this piece. But above all else, it is the movement, admirable, which convinces by its refinement. This is due to the slender and well-balanced proportions. The smooth and almost transparent monastic costume, held at the waist by a thin cord and here suggested by a fold of the robe, reveals the anatomical details such as the navel and the naturalism of the modelling. 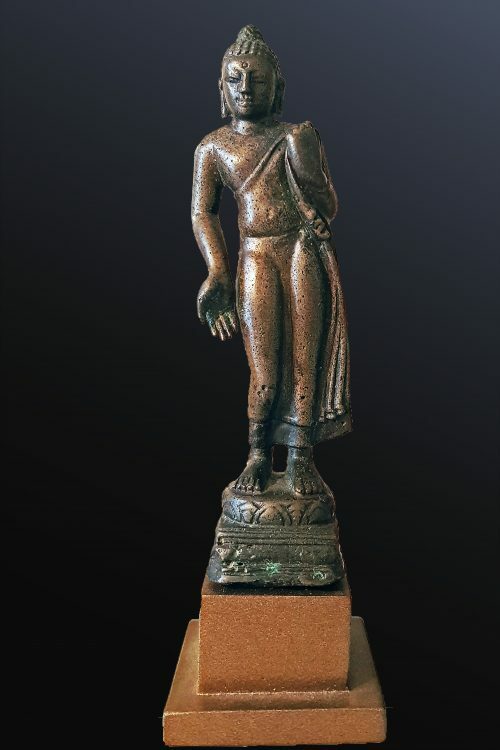 A Maṅjuśrī, discovered in Nālandā and dated 650-700 can be compared to this bronze and is published in the work of Ulrich von Schroeder, Indo Tibetan Bronzes, HK 1981, p.221, No. 47 G.
Provenance: Michael Phillips collection, Los Angeles.